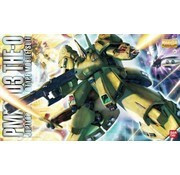 PMX-003 THE-O (MG) plastic model kit by Bandai Hobby. - It’s the 15th anniversary of the Master Grade line! The fans demanded it, and thanks to new kit technologies, it’s finally possible! Standing at over 9 inches tall and weighing in at almost a pound and a half, the massive S-class kit: The O! - At just under 1.5lbs, the massive inner frame and joint support structure emphasizes weight distribution while retaining the level of detail that you’ve come to expect in a Master Grade kit. - Hidden arms accurately recreated for this kit with moving fingers and folding gimmick. - Highlighting the power and scale of this mammoth Mobile Suit, the legs of this kit have a full, heavy feeling to ground the kit for display! 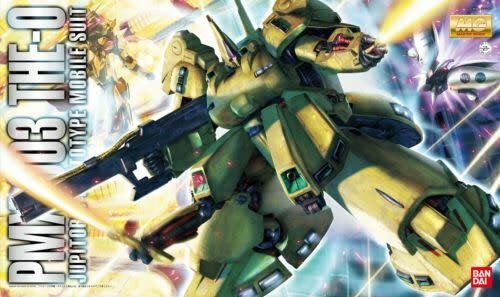 - The full body of the kit is highly detailed for a style worthy of the 15th anniversary MG kit!